One Ukrainian trooper sustained a bullet wound. Over the past day, Russia-backed separatists 41 times have violated the ceasefire in the area of the anti-terrorist operation in Donbas. One Ukrainian serviceman received a bullet wound. 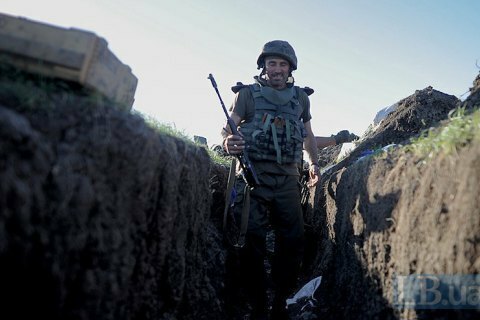 ATO forces on 28 occasions returned fire, the press center of the ATO said in a statement on Facebook on Thursday, 12 October. Most of the shelling took place in Donetsk sector, where militant groups after 6 pm twice shelled the ATO positions in the areas of Avdiyivka, Mayorsk, and Butivka coalmine with rocket-propelled grenades, heavy machine guns and small arms. The enemy pounded the defenders of Pisky from machine guns and small arms. IN one of these attacks, a Ukrainian serviceman was wounded. The terrorists also fired machine guns at Zaitseve and Nevelske. In the coastal sector, the ATO forces in Maryinka, Vodyane, and Shyrokyne were shelled from 82-mm mortars and rocket-propelled grenades. In the area of Novotroyitske, the terrorists twice used the weapons of the IFV. It was also unquiet in the Luhansk sector, where the militants shelled the defenders of Krymske, using a tank, 82-mm mortars, and anti-tank grenade launchers. The fortifications of the Ukrainian army on the outskirts of Novooleksandrivka were under the fire of infantry weapons. On Wednesday, the militants 12 times violated the truce on Donbas. There were no casualties among Ukrainian servicemen.